Providing home cabinetry with a focus on quality workmanship, Against the Grain are able to provide you with a beautiful yet practical residential fit outs, including kitchen cabinets, vanities, built-ins, laundries, home office and entertainment units. Against the Grain also specialise in commercial fit outs creating elegantly finished work spaces with a focus on high quality finishes and prompt professionalism..
Against the Grain prides itself on producing one of a kind supremely crafted pieces of furniture from a range of quality timbers and materials. 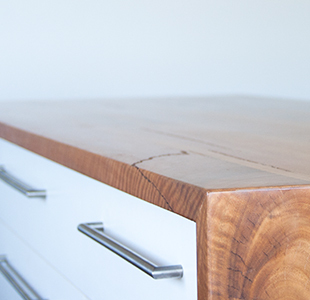 Against the grain interiors are a family owned cabinet making business based in Denmark, Western Australia. Our versatility and wide skill base enables us to provide clients with residential or commercial interiors which are expertly tailored to their individual needs and style. Please use the following contact details to get in touch, or leave us an enquiry.